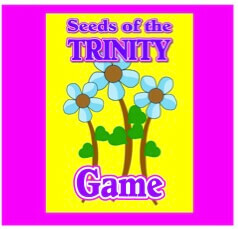 Teaching kids about the trinity can begin at early age when you play the “Seeds of the Trinity” game. This downloadable game uses great visuals to introduce the truth that we serve a triune God! 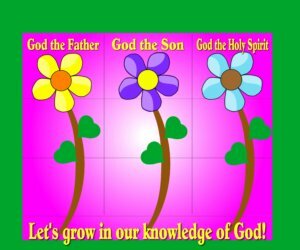 While God is One God, each part of the trinity has some specific traits that you can teach your children through the “Seeds of the Trinity” game. For example, the Bible says that “God is love.” (1 John 4:8) The Bible also says in John 3:16 that “for God so loved the world, that He gave His one and only son…” I think it’s fair to attribute the character trait of love to God the Father because of His great love for all of us. We know that God the Son, Jesus Christ, gave His life upon the cross for the forgiveness of sin. Therefore the cross is an icon that specifically belongs to Jesus. “The Seeds of the Trinity” give great visuals to help them learn more about our wonderful God. Click HERE to learn how to purchase this downloadable game from my store. A picture that represents God the Father – I chose a picture that is very colorful and that looks like a cloud. Since no one has ever seen God with their own eyes, you want your picture for the Father to be very general. A picture that represents God the Son – I chose a picture of a cross. A picture that represents God the Holy Spirit – I chose a picture of a dove. A picture of Jesus as a baby in a manger. A picture of Jesus with His disciples. A picture of a road. A picture of some fruit. God the Father: I chose this picture for God the Father because it is beautiful and powerful. The Bible says that no one has seen God the Father with their own eyes. God the Son: This is a picture of a cross and reminds us of how Jesus died on the cross to forgive our sin. God the Holy Spirit: This is a picture of a dove. The Bible says that God the Holy Spirit is like a dove. Creation: The Bible says that, “In the beginning God created the heavens and the earth.” God the Father is our loving father who created everything! Heart: The Bible says that, “God is love.” God the Father loves each one of you very much. Baby Jesus: The Bible says that God the Son, Jesus, was born as a baby in a manger. Jesus came to Earth to save us from our sin. Disciples: The Bible says that God the Son, Jesus, had many friends called disciples. Jesus wants you to be His friend too. Road: Roads take us places. The Bible says that God the Holy Spirit, is our Counselor and Guide and will tell us where to go in our lives. Fruit: The Bible says that God the Holy Spirit, grows His fruit of good character in our lives such as love, joy and peace. Finally, you will want to create a backdrop or banner or bulletin board on which your children can place each of the pictures. Here is a picture of my banner that I use that might inspire you to create your own. Begin by introducing the word trinity to your children. The word trinity is not actually in the Bible, but it is the word we use to describe our triune God. Share that the trinity is made up of God the Father, God the Son and God the Holy Spirit. Next, share the first 3 pictures, one at a time, describing each person of the trinity. Place each of the first 3 pictures at the bottom of your banner or backdrop creating 3 rows. Select 3 children and have each child hold one “seed packet.” Each seed packet will hold 2 pictures. The seed packet for God the Father will hold the pictures of creation and the heart. God the Son will have the manger and the disciples. And God the Holy Spirit will have the road and the fruit. Begin with the first child and reach into their seed packet and pull out one of the pictures. Show the picture to the class and read what is on the back. Ask another child from the class to come forward and place the picture in the correct row on your backdrop. For example, if you chose the seed packet for God the Father and pulled out the picture of creation, then the child would place that picture just above the picture representing the Father. After each picture is placed, say, “God the (Father, Son, Holy Spirit) is part of the trinity” to help solidify this concept. Continue this form of play until all the pictures have been placed on the backdrop. 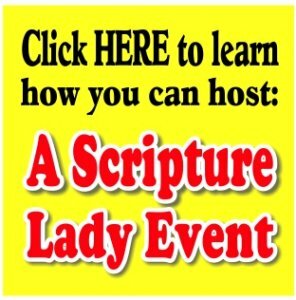 If you liked this idea for teaching kids about the trinity, then sign up to receive Scripture Lady’s Free Email Kid Tips packed full with creative ideas and receive 12 FREE Bible downloadable resources to help get the kids you minister to excited about the Bible! Just go to www.MyFreeBibleGames.com to fully subscribe.